Microplastics and Microbeads threaten the health of aquatic species and ecosystems because they absorb toxins and allow those toxins to travel up the food chain. 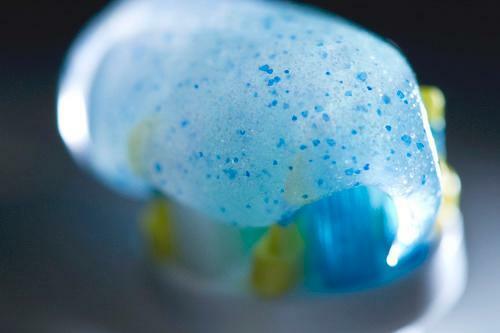 Microbeads are small, round, plastics that are commonly found in items like toothpaste and facial scrub. Microplastics are small plastics, less than 5mm in diameter, that are often broken-down or broken-off pieces of larger plastic items. Microplastics also include synthetic fibers like nylon and polyester. In December 2015, the United States passed the “Microbead-Free Waters Act,” which bans the sale and distribution of microbeads throughout the United States. The bill calls for an end to microbeads manufacturing in 2017 and an end to the sale and distribution of products containing microbeads by 2018. This ban marks significant progress in water quality legislation in the Great Lakes region and in the rest of the nation. As of January 1, 2018, through the Canadian Microbeads in Toiletries regulation, the manufacture and import of personal care products containing microbeads 5 mm or smaller in size will be prohibited in Canada. If the personal care products are also natural health or non-prescription drugs, the prohibition goes into effect on July 1, 2018. As of July 1, 2018, the sale of personal care products containing microbeads will be prohibited unless the personal care product are also natural health or non-prescription drugs, in which case the prohibition begins July 1, 2019. See below for summary sheets about legislative progress in other states, provinces, and at the federal level in the US and in Canada. Microplastics are plastics that are less than 5mm in diameter. They are created when larger plastic pieces enter the marine environment through rivers, beaches or other dumping at sea and are subsequently broken into smaller pieces by wind, waves and UV radiation. Microbeads are plastic pieces manufactured to be less than 5mm in diameter and added to common consumer care products, such as exfoliating body wash. These are then flushed down the drain and cannot be captured by wastewater treatment plants, so find their way into the Great Lakes. What Products Typically Contain Microplastics? Microplastics are found in many common consumer products, including toothpastes, deodorants, body washes, hand cleansers and facial exfoliate. You can tell if a product uses plastic microbeads if it contains polyethylene or polypropylene. Why are Microplastics a problem in the Great Lakes and St. Lawrence? In 2012 and 2013, a pair of scientific studies by Dr. Sherri Mason, professor at SUNY Fredonia, and the 5 Gyres Institute recorded the plastic content of Lake Huron, Lake Erie and Lake Superior and discovered microplastics in greater concentrations in Lake Erie than in any other body of water on earth, with concentrations exceeding data collected in the Great Pacific Garbage Patch. Fish and birds ingest them: microplastics can cause internal blockage, dehydration and death in wildlife. Ecosystem and habitat destruction: microplastics on beaches change the physical properties of beaches, such as heat retention and light reflection, which impacts organisms dependent on land temperature. Super-concentrations and bioaccumulation of pollutants: microplastics absorb pollutants already in the water such as DDT, PAHs and PCBs. When ingested by wildlife, the plastics contain super-concentrations of these dangerous toxins. They become more concentrated as they bioaccumulate in the food chain. Following a dramatic increase in legislative action during the winter and spring of 2015, the Cities Initiative released a comprehensive fact sheet on Great Lakes regional action on Microbeads. In collaboration with the Alliance for the Great Lakes, the Cities Initiative offers public education documents regarding microbeads. We invite our members to use these in their own communications material. Eriksen, M. et al., Microplastic Pollution in the Surface Waters of the Laurentian Great Lakes. Mar. Pollut. Bull. (2013). What is the Great Lakes and St. Lawrence Cities Initiative doing about Microplastics? The Cities Initiative wrote to US EPA and Environment Canada asking what the US and Canadian governments are doing and plan to do to prevent microplastics from entering the Great Lakes and to remove microplastics already in the Great Lakes. In June 2015, the Cities Initiative issued a letter to the Ontario Legislative Committee on Microbeads. Full disclosure of all products that contain microplastics. A commitment to completely phase-out all microplastic production by 2015 at the latest. Development and disclosure of plans to clean up existing microplastic pollution. To help raise awareness amongst their residents and businesses of the threat posed by microplastics. The Cities Initiative membership has also passed an Official Resolution on microbeads. What are governments doing about Microplastics? The U.S. government passed the Microbead-Free Waters Act of 2015 in late December, 2015. The bill will phase out the sale, manufacture, and distribution of microbeads by 2018. In Quebec, several Members of the National Assembly have supported citizen action on microbeads, and the issue is beginning to gain some traction at the provincial level. See the Fact Sheet under “Resources” for a comprehensive list of government action. What are companies doing about Microplastics now? Some companies have promised a voluntary phase-out of plastic beads. Others have made no commitments. Individual municipalities may pass resolutions to ban or denounce the use of microbeads within their communities. As of June 2015, the Quebec Metropolitan Community and the City of Montreal have both passed resolutions denouncing microbeads.